The town centre has 3 hotels - or pubs - as we call them back in Ireland. Three hotels for such a small town -approx 6000 locals - is good for Australia - although our local town back in Ireland of about the same pop has 35 drinking holes - but that's Ireland for you..
During the busy times of the year, - holidays, Christmas, Easter - the hotels are packed - the rest of the year they can be a bit quiet during the week - but you don't really come to Byron Bay for the night-life - although some of the backpackers might disagree with that - what do we know - our backpacking days are behind us - more or less.. The Top Pub to the locals - 20 years ago - before we moved here - it was a weatherboard cottage near the beach with gaps in the walls where the kids could look in to see the old fellas having a drink. Not any more - it's now a large central meeting place and relaxation hangout and attracts a large crowd - a place where you can have a quiet drink and watch the waves and life go by - have a pretty decent pub lunch - watch the footy or surf movies on the large screens - go more upmarket at the prestigious restaurant or get smoozled at the weekend and dance yourself silly to the live bands. You can also take advantage of their accommodation. 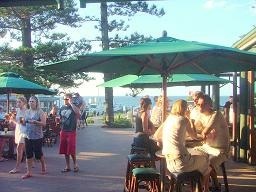 Located close to Main Beach and opposite the Main Beach Car park. The Hotel was just recently bought for a reputed cool $65 million australian - that's a lot a Schooners.. 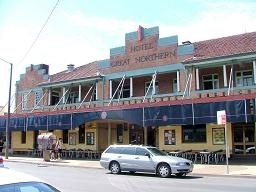 The Great Northern is a great authentic auzzie pub - it has a good bar, games room, bottle shop, pokies, the main TAB in town and it's crown jewel- The Backroom - Byron Bay's prime live entertainment venue and one of the coolest in the country. Check out the local Gig Guide - your favourite band may be performing while you're here - you never know.. The Rails is the most grungy of the 3 hotels and attracts a large backpacker crowd who enjoy the good cheap grub and live music every night. It's name comes from the fact it backs onto the railway line and is right next door to the Station. It lost something - as indeed the whole town and district did - when the last train pulled out several years ago. There were only 2 trains a day - one heading north, one south. There are sash windows which open out onto the railway platform and you could see off friends and strangers alike through the windows and keep them plied with drinks until they were ready to board. You could give em a last hug through the window, watch them board and wave them goodbye all without leaving your barstool or putting your drink down. It has a romantic old world charm which diminished slightly with the last train but we still have hope the trains will one day return - preferably steam - can you have an environmentally sound steam train? The Rails is still going strong and a good spot to get to know some of the many backpackers and locals. Check out the local Gig Guide - as there's someone different playing there every night from 6.30. Don't forget about The Suffy - the Suffolk Park Hotel 6 kms south of Byron Bay - a more local crowd than at any of the pubs in town. 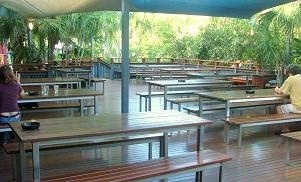 The Suffolk Park Hotel has a good beer garden, TAB, bottle shop, and bistro. 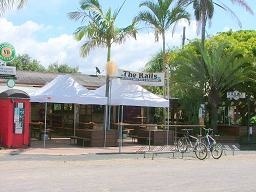 A great place to watch the weekend footy with a mostly local crowd and good atmosphere. The Suffy is part of the Suffolk Park Shopping centre which includes a supermarket, fish & chip shop, laundry, video store, post office, bakery, cafe and pizza shop - the shopping centre is a favourite for local skateboarders with their gravity defying shorts. At Cheeky Monkeys - get a $2 meal and $5 jugs of beer, let loose dancing on the tables and get free drinks for taking your top off - that sort of place - those were the days..
Cocomangas - Has been around for years - Newly renovated in 2004 it is going strong and now has a Tapas Bar upstairs and offers modern Australian style tapas dishes with balcony dining overlooking the heart of town. Designed to share, tapas is a very social way to dine. Check out some of the local gig guides for more info. There are a few gig guides out there to check out the night life and what's on. Especially useful if you are looking for live entertainment. One we find very good is byron bay entertainment - lots of info on not only Byron Bay venues but neighbouring villages too. Well worth a look. Here's the link again for their Gig Guide so you can see who's playing while you're here. 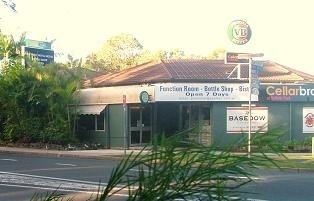 We may be wrong but we don't consider Byron Bay the major party town that it's cracked up to be. It certainly doesn't deserve the wild image it's been given at times in the media. Most venues close at 12 or 1 am - a few soldier on till 3 but that's as late as it gets. The streets are usually pretty empty by 12 midnight. 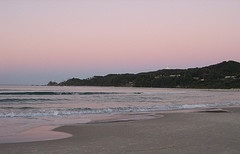 We don't want to suggest Byron Bay doesn't have much nightlife but we don't want you to be disappointed either. There's plenty of places to go and things to do but don't expect to be crawling home from the pub every night as the sun comes up.. It's all there for you but it's not Sydney, Melbourne or London - and we don't really want it to be..
Or we may just be out of touch and out of the loop - make up your own mind..